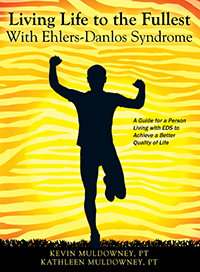 This book was written to teach people with Ehlers-Danlos Syndrome (EDS) how to systematically progress through an exercise program to allow their muscles to support many joint subluxations commonly associated with this genetic disorder. This will allow people living with EDS to have less pain throughout their body. The exercise protocol outlined in this book was developed by a physical therapist from Rhode Island, Kevin Muldowney, MSPT, who has been treating people with EDS since 2005. Kevin has lectured to numerous EDS support groups, as well as, at the Ehlers-Danlos National Foundation Learning Conference. He currently owns two physical therapy clinics in Rhode Island that specialize in treating people with EDS. All of the physical therapists at Kevin’s clinics were trained by him to use specific manual therapy techniques and the exercise program outlined in this book to guide people, living with EDS, to decrease their pain and increase their function of daily life. Hopefully this book will serve as a guide for you to live a better quality of life while having EDS. Kevin Muldowney,PT has been successfully treating people with EDS for many years. He is committed to helping this population achieve a better life. He developed a physical therapy protocol for people with EDS. This book outlines his protocol. Kevin's goal for his book is that every person with EDS will receive the same high quality care the his patients do everyday in his clinic. Go to muldowneypt.com for FAQ about the book.